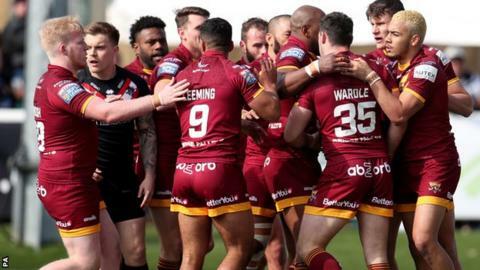 Huddersfield Giants moved two points clear of bottom club Leeds Rhinos with a high-scoring win at London Broncos. Akuila Uate crossed either side of half-time for the visitors, who scored five tries before the break to lead 28-12 at the interval. Kieran Dixon replied with a double of his own for London, who lost at home for the second weekend in succession. Huddersfield are now level on points with the Broncos, who have played a game more than the Giants. Joe Wardle touched down after only three minutes to give Huddersfield the perfect start, while Jermaine McGillvary marked his selection in England's performance squad earlier this week with a try of his own before the break. Rhys Williams' length-of-the-field score after half-time kept London in the contest, but Huddersfield were always able to maintain a gap to their opponents and rarely looked like being overhauled. "Credit to Huddersfield, they were very good in the first half but we seemed to just lack a bit of attitude to defend our line properly. "We started slowly again and gave ourselves way too much to do. "A lot of that comes down to attitude. I don't question the attitude of this lot often, but a few too many of them had off days in that area today. "But they're a good group and I know they'll work hard to put that right." "In the past month we've shown glimpses that we've turned the corner. "I've been around long enough to know that you'll go through those periods at some stage during the year. "Unfortunately for us it hit us early, but we've come through that now and put ourselves in a much better position in the past two or three weeks." London Broncos: Walker; Dixon, Fleming, Kear, Williams; Abdull, Smith; Butler, Pelissier, Yates, Pitts, Gee, Davies. Interchanges: Fozard, Mason, Richards, Battye. Huddersfield: McIntosh; McGillvary, Turner, Senior, Uate; Gaskell, Frawley; English, Leeming, Matagi, Wardle, Mellor, Lawrence. Interchanges: Ikahihifo, Roberts, O'Brien, Ta'ai.